Wagyu Beef has a very fine texture and velvet-like marbling. Top international chefs and gourmets praise the marbling as a source of unequalled tenderness, succulence and flavor. They have praised Wagyu as the best beef in the world. Serve Wagyu Beef and you will be serving your guests a healthy meat, with exceptionally high proportions of mono- and polyunsaturated fatty acids, also high in Omega-3 fatty acids. Chefs can prepare this meat without butter because the fats melt out at a very low temperature. It has been scientifically proven that these special properties make the meat healthier. 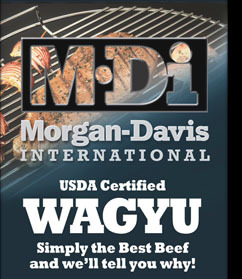 Your guests will enjoy Wagyu Beef with confidence. The Butcher Shop will soon feature Consumer Boxed Beef.